Mr Tamimu standing in his old field of an open-pollinated cabbage variety. His new field can be seen at the bottom of this story. Mr Salimu Tamimu (57) from Mrua Village in Kondoa District has been in the field of local vegetable farming for 30 years. He grows tomatoes, sweet pepper, cabbages, onion, cucumbers, African eggplant and okra. “I had no place to seek advice, while facing a lot of challenges for pest and disease control. I did not know which fertilizer to use”, he said. In March 2017 he met with SEVIA’s Extension officer, Paschal Lusolela. Mr Tamimu was keen to host a demo on hybrid versus open pollinated cabbage production and sweet pepper pruning. 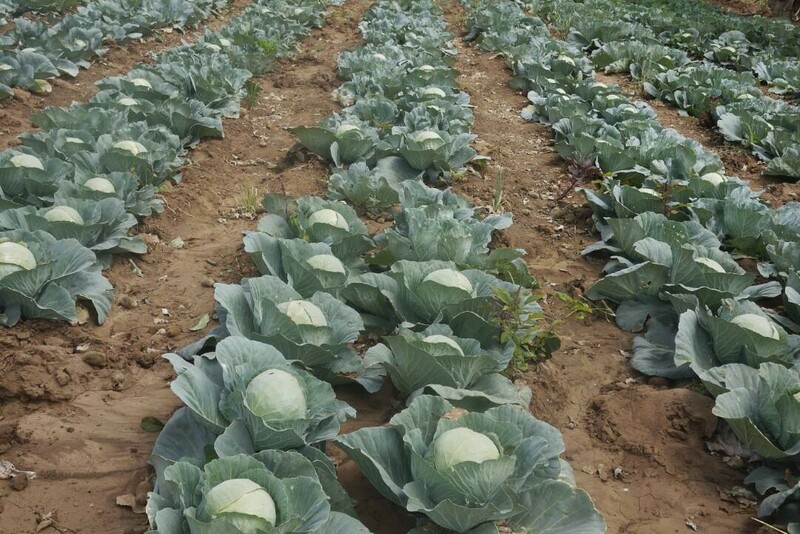 EWS and SEVIA (Seeds of Expertise for the Vegetable Sector of Africa) have developed a partnership that provides ongoing demonstrations to farmers to help them visualize the results of using quality vegetable seeds and good farming practices. Being inspired by the SEVIA field day in July, Mr Tamimu is considering to buy a drip irrigation kit for 1/4 acre.